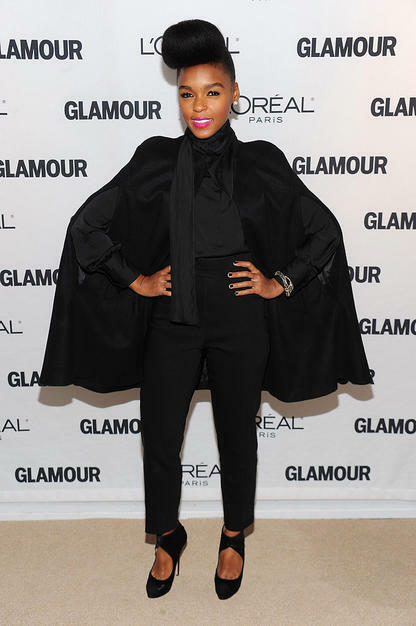 Janelle Monae: Funky, Fierce, Cool. Janelle Monae. Say this name around me and you will definitely get a response. Since her second album ,”The ArchAndroid (Suites II and III)” came out I have been obsessed with everything about her. From her effortlessly chic menswear inspired outfits, to her fierce pompadour hairstyle, to her mind-blowing vocals and lyrics, “J. Monae” has had me hooked. So when I found out that Janelle Monae would be coming to Austin with ‘Of Montreal’ I nearly passed out! I would finally get to see Janelle in action. 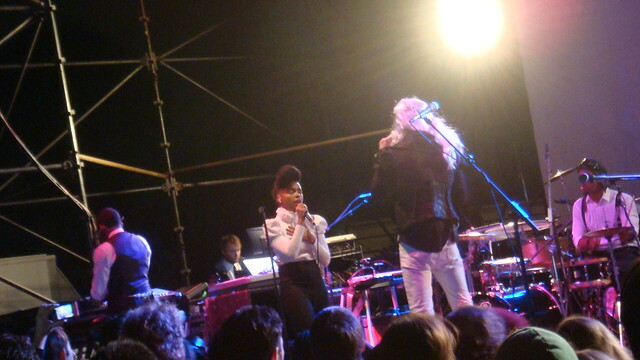 Janelle Monae was scheduled to perform with ‘Of Montreal’ at “East Side Drive In.”Nov. 4th. Now, if you live in Austin and have never been, it is definitely a must. A large outdoor venue complete with cool locals and double-decker busses serving their own creations, it is far cooler that anything we have in Houston. 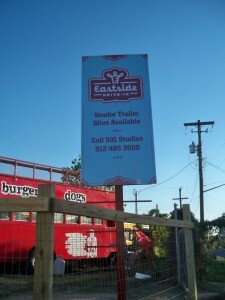 “East Side Drive In” is the epitome of Austin and it’s reputation for one of the best live music venue’s in the world (yeah, I said WORLD). Janelle went on at around 7:15 ish and to say it was mind-blowing in an understatement. I can honestly say that Janelle Monae is one of the most electrifying and energetic performers that I have ever seen. 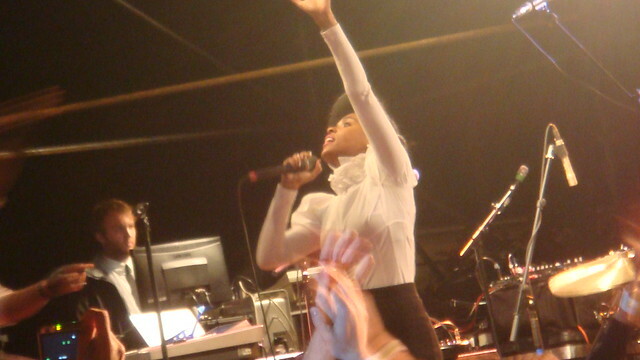 Janelle sang many of her hits like, “Sincerly Jane”, “Cold War” and “Smile”. Now, there where many moments that I absolutely loved but one of my favorites was Janelle’s performance of Cold War. Full of raw passion and energy, the song riled up the crowd, leaving few standing still. 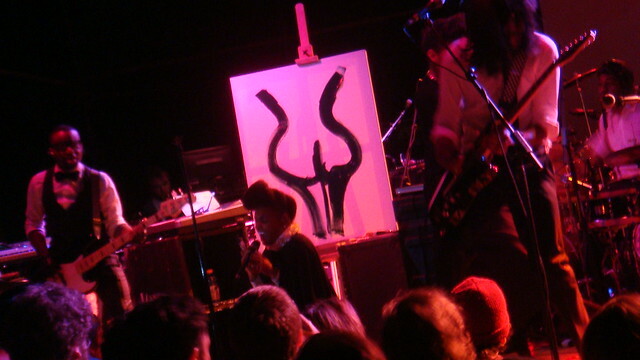 Another brilliant moment was during Janelle’s performance of “Mushrooms and Rose’s” where during the song she brought out and easel and canvas and began to paint the shape of a woman. Watching Janelle Monae incorporate art and music, one of my dreams, was something I won’t soon forget. But, the coolest moment of Janelle’s set was without a doubt her performance of her hit single “Tightrope” where she threw on a James Brownesque cape,” tipped” on the tightrope and whipped her hair out of her normally perfectly coiffed pompadour. The result was and explosive ending that left me wanting more long after she left the stage. And a the end of the “Of Montreal” ( a strange, fun group that would require another post to accurately describe) set she joined the group in a rendition of Michael Jackson’s “P.Y.T (Pretty Young Thing)” that came alive with her amazing vocals. Janelle Monae is music. She dips into the past with her homage to James Brown and Charlie Chaplin, she lives in the present, and her music and mind are in the future. She is a ballsy, funky, and fiercely intelligent musician who does let the fads and demands of the music industry change her music. She doesn’t dream it, she does it, and she does it WITH HER CLOTHES ON! Janelle is on the verge of greatness. It’s only a matter of time till the world gets tired of the Ke$ha’s and Nicki Minaj’s of the industry and start to demand real music. And when they do, Janelle will be right there ready to “tip” on the tightrope. Here’s a few of my favorite quotes from Janelle! The fabulous Janelle! This is my favorite picture of her! Such a stunning woman! “So you think I’m alone?